A Christmas wedding leads to a high-heat, food-filled romance in the third volume (Perfect for You, 2017, etc.) of the Sunshine Creek Vineyard series. Reality TV chef Parker Kincade is rushing to raise the barn that will house his brother’s wedding reception when Gabriella Montani begs for a chance to cook for him. The estranged daughter of a celebrity chef is desperate to escape both her father’s legacy and her terrible job as a personal chef for a lottery winner. All Gabi needs is a chance to prove her skills. Parker is immediately drawn to Gabi, and it’s not long before the job interview turns into a one-night stand. With both their careers on the line, neither of them is ready for a relationship, but working side by side makes it difficult for them to keep their distance. The explicit details of their romantic interludes and three-course Italian dinners will be, as Gabi puts it, “deliciously remembered at the end of the night.” But family drama and long-buried secrets threaten to tear them apart. The rest of the Kincade family pops in with plenty of news to share—older brother Jordan is helping his fiancee, Lucy, with the wedding plans, and Aunt Pippy finally tells the Kincade siblings “the story that would either make or break them and their fragile beliefs” about their parents. Readers who are new to the series will be able to get the gist. 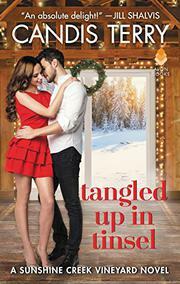 Hotter than hot cocoa and just as sweet, it’s a good read for getting into the holiday spirit.